A hillbilly from Tupelo, Elvis Aaron Presley was the first musical megastar of the rock and roll era, as well as being the most dramatic example of a celebrity transformed into a cult deity by premature death. Quite a bit could be learned about the nature of celebrity worship from the Cult of Elvis phenomenon that has emerged -- even more so than from the hysteria surrounding The Beatles -- but it generally tends to be regarded as no more than a freakish anomaly rather than an extreme form of what is actually a common human impulse; in fact, the fanaticism of Elvis' fans has now become as deeply rooted in Western (and other) popular culture as Presley and his music -- take a look at films such as True Romance (1993) or even Bubba Ho-Tep (2002) for two very different representations of this phenomenon. People have always displayed a need to create a larger-than life figure with which to associate themselves -- the shift to entertainment figures from political figures has been gradually taking place since the invention of the motion picture -- and Elvis has now become the patron saint of this tendency, sometimes even expressed as "fill-in-the-blank" is my Elvis, such as cartoonist Matt Groening's comment in a 1992 interview that "Frank Zappa is my Elvis." Elvis Presley was brought into the world in 1935 by truck driver Vernon Presley and his seamstress wife Gladys Smith. His twin brother Jesse Garon Presley arrived at the same time but was stillborn, leaving Elvis to grow up as an only child. Raised in poverty, Elvis developed his singing talents at the famiy's Pentecostal church, and by the age of ten managed to win second prize at the Mississippi-Alabama Fair and Dairy Show with a version of the song Old Shep (a performance broadcast by local station WELO); this accomplishment motivated his parents to buy him an acoustic guitar, after which the young Elvis spent as much of his free time as possible teaching himself to play. In 1948 his family moved him to Memphis, and it was here that Elvis fell under the influence of black R&B performers such as B. B. King by way of the thriving music scene centered around the city's Beale Street clubs. In Memphis, Presley's musical abilities continued to gain recognition, and in his next talent show the shy teen earned first place through the enthusiasm of his classmates. Blue-collar work at a machinist's shop was taken immediately after graduation in 1953, but Elvis' ambitions to become a professional musician were not abandoned: that same year he paid $4 to record himself singing My Happiness and That's When Your Heartaches Begin at Sam Phillip's Memphis Recording Service, but he was disappointed by the results. After a short-lived job with the Precision Tool Company, Elvis spent a period in his father's vocation, driving a truck for Crown Electric while also attending night classes to become an electrician. A second attempt at recording (A Casual Love Affair and I'll Never Stand In Your Way) was made at the start of 1954, but this time with Phillips himself in attendance; intrigued by the young singer's performance, the Sun Records owner invited him back to create further recordings later in the year. Despite Phillip's dissatisfaction with his first session with Presley, he remained convinced that the singer's version of black R&B had considerable potential. A backing band featuring guitarist Scotty Moore and bassist Bill Black was assembled, and after a few months of rehearsal the tracks I Love You Because, Blue Moon Of Kentucky and That's All Right were recorded in July of 1954. The last of these three tracks (backed by Blue Moon Of Kentucky was then released by the Sun label as Presley's first single, causing an immediate stir in the local music scene: listener response to the song's airplay was enthusiastic, as was the audience response to the trio's subsequent club performances. Moore took on the role of manager for the group, and appearances at various Southern radio stations (and one at the Grand Ole Opry in September) continued to build on the initial success brought about by the single. Later in the year, Elvis began to make regular appearances on the popular live radio program Louisiana Hayride, which continued throughout 1955. After releasing his second single Good Rockin' Tonight b/w I Don't Care If The Sun Don't Shine, he made his first televised performance on the local television version of Hayride in March of '55; by this time Moore had passed on management duties to disc jockey Bob Neal, who soon afterwards would be responsible for involving the dubious character Colonel Tom Parker in Presley's career. Public response continued to grow with each new release, the single Baby, Let's Play House b/w I'm Left, You're Right, She's Gone climbing to #10 on the country charts in July of '55, followed by Presley's first #1 Mystery Train b/w I Forgot To Remember To Forget in September. This success increased the interest of Parker, who quickly pushed both Neal and Phillips out of the picture by arranging a lucrative contract for the singer with the RCA label. With the re-release of his Sun singles on RCA, Presley's popularity quickly expanded from being a Southern to a nation-wide phenomenon. A series of performances on the national TV program Stage Show led to high-profile appearances on variety shows such as The Milton Berle Show, The Steve Allen Show and The Ed Sullivan Show throughout 1956 -- instigating a level of hype that would frequently result in riots at the singer's public appearances, and carried the first RCA-recorded single Heartbreak Hotel b/w I Was the One to the top of the mainstream pop charts. Parker took full advantage of the situation by arranging a seven-year contract for his client with Paramount Pictures, moving the focus of the next stage of Elvis' career from records to films. The first of these films, the Civil War drama Love Me Tender (1956) was met with enormous box-office success and even reasonably positive critical reviews. Having been established as an international celebrity and the center of a multi-million dollar merchandising business, in 1957 Presley purchased Graceland Mansion as a home for himself and his family, where he would reside for the remainder of his life. His film career proceeded at full steam throughout '57 and '58, the feature Loving You (1957) once again providing him with the dual box office/record album success of Love Me Tender -- an achievement again repeated by his next two films Jailhouse Rock (1957) and King Creole (1958). Live performances also continued to be received with hysterical enthusiasm by crowds of teenagers throughout the U.S. (and, on a few occasions, in Canada). A widely-publicized interruption to this new lifestyle arrived in March of 1958, however, when Elvis reported to Fort Hood to begin basic training for the US Army, having received his draft notice in December of the previous year. During the next two years the Army remained the focus of Presley's life, the singer only managing one recording session (scheduled after the completion of his training) before his discharge in 1960. The majority of his service was spent at Wiesbaden Air Force Base in Germany, and it was here that he met Priscilla Ann Beaulieu -- only 14 at the time, but whom he would eventually marry in 1967. The hype surrounding Presley was scrupulously maintained by Parker throughout his client's absence, and recording, television and film work was immediately resumed upon his re-entry into civilian life: the album Elvis is Back!, a television special called Frank Sinatra's Welcome Home, Elvis and the motion picture GI Blues were all completed and released before the end of 1960. For the first few years of the 1960s, Presley's popularity remained unrivaled in his home country -- although response to the endless succession of the singer's films (his 21st (!) being released by the middle of 1965) went through unavoidable fluctuations. The arrival of the so-called British Invasion in the mid-60s (and particularly the impact of The Beatles) ultimately deflected the public taste in a different direction (despite the ironic fact many of these bands, Beatles included, would cite Presley as a major influence on their own creative output), and the social changes accompanying this shift in popular music also put the conservative-minded Presley out of step with the young people that used to stampede to his live performances. By 1966 attendance to his films began to decline, and his albums and singles ceased to enter the top 10; by his 28th film Live a Little, Love a Little (1968) his career was in an undeniable slump, the soundtrack album climbing only as high as #82 on the charts. In an attempt to breathe some life into his stagnating career (and to restore his own enthusiasm for performing), in mid-1968 Presley staged a television special simply called Elvis, broadcast by NBC on December 3rd. This was his first performance in front of a live audience since a pair of concerts at Ellis Auditorium in Memphis in February of 1961, and featured a cross-section of his hit songs and musical styles, as well as reuniting him with Scotty Moore and D. J. Fontana from his original band. 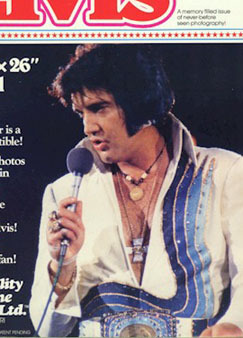 The program did briefly restore some of Elvis' previous glory, receiving both high ratings and strong critical notices. Presley then followed up with what would prove to be his last #1 single, Suspicious Minds, in the latter half of 1969 -- although the fortunes of his excessive film output (his 31st feature, Change of Habit, limping it's way in and out of theaters in Novemeber of '69) continued to decline. Upon the arrival of the 1970s, the focus of Presley's activities moved away from film projects and returned to live performances. Most of these shows took place at resort-oriented venues such the Las Vegas Hilton and the Sahara Hotel in Tahoe, with the singer staging extended engagements at the Hilton every year between 1970 and 1976. The single Burning Love placed Elvis at #2 on the mainstream charts in 1972, and during the first half of the 70s several other of his singles would top the charts in Germany and the UK, as well as the country charts in the States. By 1973, however, physical problems ranging between his addiction to prescription drugs, pneumonia, hepatitis and various complications brought about by his weight gain began to interfere with his performance schedule, and in 1975 he would be forced to spend periods in the hospital on two different occasions. His unhealthy lifestyle inevitably caught up with him, and while taking a break after several months of touring, Presley was found dead of heart failure in his Graceland home on August 16, 1977 at the age of 42. Hollywood Walk of Fame 6777 Hollywood Blvd.